I'm eating a fistful of carrots right now. Along with crackers and cheese. And water. I'm a single lady for the next couple of days, the husband is away for work. Which means, I don't really eat "real" meals. It's not like I'm not eating anything, but nothing really of substance. Just snack stuff. I might get hangry later, so I might eat a salad. Or popcorn. What I should be eating is grilled pizza. I made it last night before the husband left because I wanted to eat pizza, but he won't let me turn on the oven. It's been an average of 28 degrees over the past week, but our apartment feels like a million degrees. Since we're too lazy to pull out our air conditioner, just in time for us to put in back, I've been banned from using the oven. 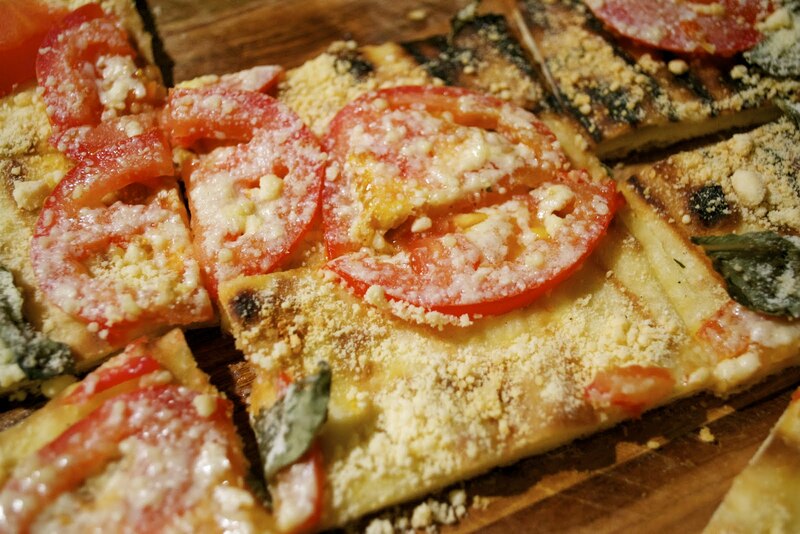 Grilled pizza is super easy. Make your favourite dough (or buy it, no judgements), roll out per usual, coat one side with oil, throw down on your hot grill, cook it up for a few minutes, coat uncooked side with oil, turn the dough over and then top cooked side with toppings. Let cook for a couple more minutes, voila! Grilled pizza. 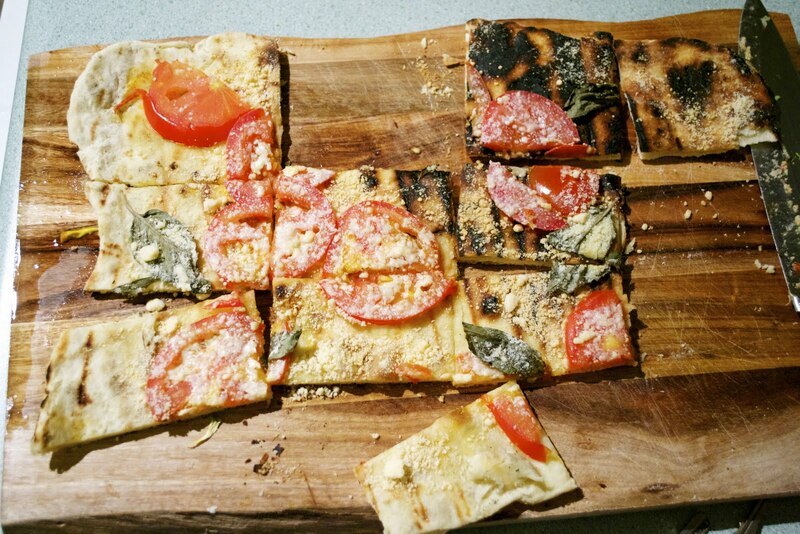 It tastes like a pizza that came out of a wood-fired oven, much better than an oven cooked pizza. Crispy, crunchy with little charred pieces on the ends. Nom. Plus you can top it with anything. I used sliced tomatoes, fresh basil, and parmesan cheese. Get on this, cause popcorn really isn't dinner. Roll out dough, on a lightly floured surface, to a 9x13-ish rectangle. Transfer dough rectangle to a baking sheet for transport. Heat your BBQ to approximately 400 degrees, keeping it at about medium on the dials. 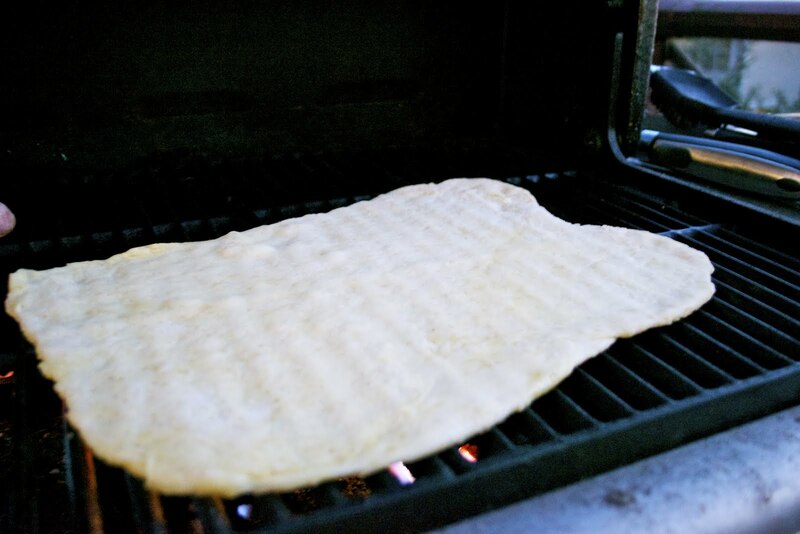 Brush olive oil on one side of the dough and transfer oiled side to the BBQ, draping it onto the grill. Grill for 3 - 5 minutes, frequently lifting edges with tongs to ensure there are no burnt spots from hot spots on your grill. I rotated mine halfway through to ensure even cooking. Brush uncooked side with olive oil and flip the dough, to grill the other side. Topped grilled side with toppings and continue grilling for another 3 minutes. 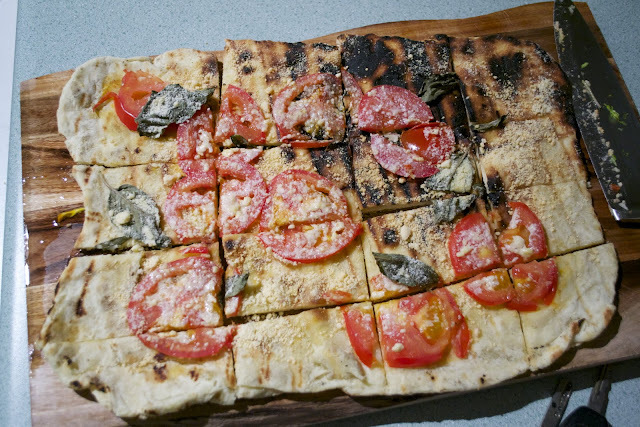 Once the un-topped side has been cooked thoroughly, transfer pizza to baking sheet and slice to serve.